So, I've been following this year's Glasto with a raised eyebrow - as it turns out, Eavis' plans for shoring up his flood defences worked... to an extent... but he still needed JCBs in to dig out the area in front of the Pyramid Stage to fill it with straw. Reminds me of when I last went in 2004! I first went in 2003, and it was just glorious weather - blazing sun all day, I got so sunburnt it was ridiculous. 2004 I went with my mum, as she'd never been, and it rained... And it poured! Nevertheless, we had a good time. My housemate's at this year's Glastonbury with her family - she's coming back on Tuesday, so we're all having to wait to clean the carpets and stuff until after she's taken off all her muddy clothes and tramped through the house! Our tenancy agency (Campbell Property) are sneaky bastards, they put cream carpet through the whole of the house and painted all the walls matte white so EVERY mark shows up so clearly. And then they want �150 to clean the carpets (and loads of money for just about everything else that could possibly be cleaned or painted) unless we do it ourselves! The maddest thing is that we're here next year too, but we still have to move out... What a crock. I was thinking about how maybe climate change would force a change to the date, but Michael Eavis was adamant about the dates for the festival remaining as they are so they coincide with the Summer Solstice, and I fully agree with that. The spirit of Glastonbury is something very special, and whilst I'm not a spiritual person I can acknowledge that other people are - and that in turn lends to the overall feel of the place during the weekend. I'm pretty sure the festival being in the Vale of Avalon, at the convergence of several ley lines, has something to do with it. 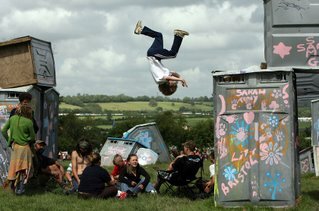 On the final day of the Glastonbury Festival 2007, Michael Eavis had a few words to say about how the Festival has gone this year: �It�s gone very well, in spite of the rain and in spite of the mud. The drains have actually worked, believe it or not. Someone called me from Spain and said they would swap all the sun they had for the Glastonbury culture. Asked about the size and timing of the Festival, Michael said: �For the first time in my life I went up in a helicopter yesterday, and I was amazed to see that there was still spare camping space and car parking space. Questions were asked about reports of the crowds calling for The Killers to be turned up on Saturday night, and Michael apologised for sound levels of the PA. I look forward to (hopefully) going in 2008! Right, time to pack up some more of my stuff and head home for the weekend. Only one week left until I have to start working over the summer again to help pay for next year's rent. into his blog at 6/24/2007 07:39:00 PM. Roughly.